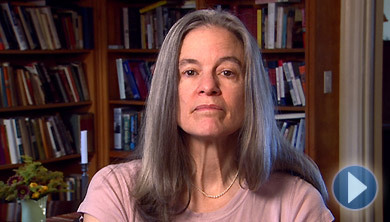 "I see them standing at the formal gates of their colleges..."
Sharon Olds has said that she does not ask "a poem to carry a lot of rocks in its pockets." Olds was 37 when she published her first book of poems, Satan Says (1980). She had completed her second dissertation on Ralph Waldo Emerson, earning her PhD at Columbia in 1972, when she vowed to give up everything she had learned, and write poetry, for better or for worse. Many volumes of poetry later, Olds "continues to witness pain, love, desire, and grief with relentless courage," according to Jacque Kahn. In addition to many other awards and honors, Olds served as New York State Poet Laureate from 1998-2000. She teaches at NYU's Graduate Creative Writing Program, and is the founding director of NYU's creative writing workshop program for severely physically disabled patients at Goldwater Hospital on Roosevelt Island in New York City. "I Go Back to May, 1937", from THE GOLD CELL by Sharon Olds, copyright © 1987 by Sharon Olds. Used by permission of Alfred A. Knopf, a division of Random House, Inc. For Online information about other Random House, Inc. books and authors, see the Internet Web Site at http://www.randomhouse.com. To read this and other poems by Sharon Olds, as well as biographical information about the poet, please visit the Poetry Foundation Web site.